On Thursday 11th February 1858, Bernadette heard a noise that sounded like a gust of wind and she saw a light. She saw a small girl, dressed in white, with a blue belt, a yellow rose on each foot and a rosary beads on her arm: It was the Blessed Virgin Mary. Bernadette continued to meet her on 18 occasions until 16th July 1858. The number of people accompanying Bernadette continued to increase. 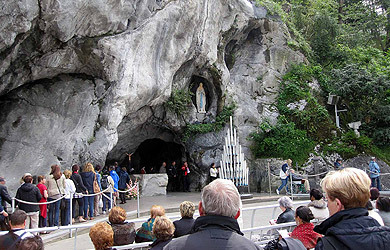 At the time of the Apparitions as many a 10,000 people gathered at the Grotto. Today, about 6 million pilgrims and visitors come each year to recollect themselves at the rock of Massabielle. All eyes converge first of all towards the crevice in the rock where the Blessed Virgin Mary appeared. A statue (1.88m) representing Our Lady of Lourdes, dressed in white with a rosary beads on her right arm and two yellow roses on her feet, just as she appeared to the young Bernadette on 11th February 1858, was installed in this spot on 4th April 1864. The statue was the gift of two sisters from Lyon, the Misses Lacour. It was created by Joseph Fabish, a professor at the School of Fine Art in Lyon. On the pedestal of the statue, we read ‘Que soy era Immaculada Conceptiou’. It was in this way, in the dialect of Lourdes, that, on 25th March 1858, the Virgin Mary identified herself to Bernadette: ‘I am the Immaculate Conception’. On the ground, to the left in front of the Grotto, a stone plaque marks the exact spot where Bernadette stood: Bernadette prayed here on 11th February 1858’. At the back of the Grotto, to your left of the altar, you can see the flowing spring that Bernadette discovered on 25th February 1858. This water, in order to make it available to everyone, is now channelled towards the taps and the baths. Inside the Grotto, behind the altar, one can find the box where people place their prayer petitions. In front of the Altar is another stone recalling the visit of Pope John-Paul II on 15th August 1983.
the Blessed Sacrament Procession that crosses the Meadow each afternoon from the Tent of Adoration. Here, the camera does not block the view. It also has the required distance to film the Grotto correctly in all its dimensions and at the same time not identifying the people moving through its field of view. About 40,000 pages of the internet site are consulted each day. The lourdes-france.org website has some interesting webcams too. The first chapel to be built in response to the request of Our Lady to Bernadette on 2nd March 1858 during the 13th Apparition: “Go, tell the priests to have a chapel built here”. Saturday 19th May 1866 (Vigil of Pentecost) by Mgr Laurence, Bishop of Tarbes with Bernadette present. 120 seats and 5 wheelchairs. Over the entrance there is a mosaic of Pope Pius X. The walls of the long corridor entrance that begins with statues of St. Peter and St. Pius X are covered by votive offerings. On the walls of the chapel you find many of the votive offerings in thanksgiving to God for graces received through the intercession of Our Lady. 15th August 1871 by Mgr. Pichenot, Archbishop of Chambery. Raised to the status of a Minor Basilica by Pope Pius IX on 13th. March 1874. 550 seats and 5 wheelchairs. Over the main door there is a picture of Pope Pius IX. By the entrance on the right is a marble plaque containing the complete text of the judgement made by Mgr Laurence, recognising the Apparitions as authentic. The Upper Basilica is decorated with numerous pilgrimage banners given by pilgrims from all over the world. From 7.00am to 10.00pm the peal of bells of the Upper Basilica rings every quarter hour and on the hour plays the “Ave Maria ofLourdes”. 6,7.& 8 August 1889 by Mgr Gouzot, Archbishop of Auch. Consecrated on 6th October 1901 by Mgr Langenieux, Archbishop of Reims. Raised to the status of a Minor Basilica by Pope Pius XI on 24th. September 1926. 1,500 seats and 50 wheelchairs. In the form of a Greek Cross and of a neo-Byzantine style, the Basilica invites us to rediscover the deep meaning of the Rosary as a prayer. The interior architecture is highly symbolic. The central dome rests on 4 pillars forming a square. The circular dome represents heaven and the square base represents the earth. This is where the Eucharist that joins earth and heaven is celebrated. Around the central dome, the arms that are the Transept and the Sanctuary contain side-altars with mosaic images of the 15 mysteries of the Rosary. The Transept on the left contains the events of the childhood of Jesus that are the Joyful Mysteries of the Rosary (The Annunciation, The Visitation, The Birth of Jesus, The Presentation of Jesus in the Temple, the Finding of Jesus in the Temple). Behind the Sanctuary, five altars show the events linked with the Passion of Jesus: the Sorrowful Mysteries of the Rosary (The Agony in the Garden, The Scourging at the Pillar, The Crowning with Thorns, The Carrying of the Cross, The Crucifixion). Finally, on the right Transept are altars depicting the events linked with the Resurrection of Christ, the Glorious Mysteries of the Rosary (The Resurrection, The Ascension, The Descent of the Holy Spirit on the Apostles, The Assumption of Our Lady into Heaven, The Coronation of Our Lady). Everything focuses on the gathering of the people of God, the Church. The building is in the form of an ellipse, the roof is in the form of an upturned boat and the centre point of the altar signifies that the Church the “barque of St. Peter” guided by Christ. In the meaning of the Magnificat Year, the Sanctuary wished to highlight the Crucifix hanging beside the High Altar of the Underground Basilica of St. Pius X. This is the work of the artist Mr. Louis Pustetto. To do this, the Crucifix was lowered to the level of the High Altar and statues of St. John and the Blessed Virgin in the same material as the cross will be placed at the foot of the Cross. Calvary comes from the Latin word Calvarius a translation from the Aramaic word “Golgotha” (the Place of the Skull) which was the hill outside Jerusalem where Jesus was crucified. The blessing of this Calvary took place on 24th. March 2001 at 5.30pm. by Bishop Jacques Perrier, Bishop of Tarbes and Lourdes. Although the decoration of the Basilica is austere it was improved during the Jubilee Year with 36 images of saints and martyrs. A short biography of each saint is placed on the pillar next to the image. 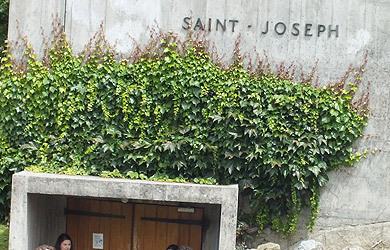 The chapel of St. Joseph is a semi-underground building built close to St. Michael’s Gate. It is built in a modern open style. The Sanctuary is directly lit by a skylight in the ceiling. The statues of the Blessed Virgin and St.Joseph are placed at each side of the Altar. The Shrine of Our Lady of Walsingham (England) presented a statue of Our Lady of Walsingham in 1984 and is found on the opposite wall to the altar. Built on the spot where St. Bernadette stood on the day of the last Apparition. 25th March 1988 by Mgr. Donze, Bishop of Tarbes and Lourdes. 4,370 seats and 320 wheelchairs The Building; The style of the building is completely modern. It is an image of the world of to-day, a world searching for meaning, a world searching for a sign of hope, a world that is not aware that salvation in their midst. This is why in the middle of this building of metal and concrete hangs a huge image of Christ in gilded wood, a Christ who is glorious, victorious, overcoming the Cross, arms wide open, attracting attention, welcomes the pilgrims, gives warmth to the atmosphere. The altar furniture is designed by the sculptor, Mr. Dominique Kaeppelin. The organ was built by Barthelemy Formentelli & Co. The building can be divided in two by a huge partition. There are many smaller meeting rooms around the building. On the right is the Hemicycle, a room with 300 seats where the autumn plenary session of the French Episcopal Conference is held. 18th June 1995 by Mgr. Jean Sahuquet, Bishop of Tarbes and Lourdes. The Tent of Meeting symbolised by the cloth of the ceiling. The Cloud of Fire that led the people of God across the desert to the Promised Land is symbolised by the gilded column containing the Eucharist. Today, Christ, crucified and risen, is the light that enlightens us and leads us. The New City, the New Jerusalem, is symbolised by the 12 columns representing the 12 Apostles. A small altar was installed at the foot of the Eucharistic Pillar in 2001. A Mass will be celebrated there during the morning. The Sacred Host consecrated at this Mass will be put in a ciborium and placed in the Pillar with the veil open. The Adoration Chapel will remain open throughout the day. The Blessed Sacrament will be exposed there from the end of the afternoon Benediction midnight. 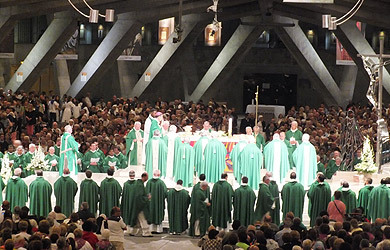 A new Tent of Adoration was put in place for the beginning of the 2001 season. It is situated on the meadow near the lower bridge. Its design is like the awning erected in front of the Grotto. It covers and area of some 500m2 and allows for pilgrims to spend an extended time of prayer in front of the Blessed Sacrament during the day from 8.30am to 5.00pm. It is accessible to the disabled. The Blessed Sacrament is exposed here during the day before it is taken in procession for the blessing of the sick each afternoon. Our Lady of Lourdes made a call for a conversion of heart. The believers must deepen their faith. Lourdes invites the Christian to this spiritual experience and to this reconciliation with the Father who is loving and all merciful. Until 1997, the Reconciliation Chapel was situated at the foot of the Way of the Cross. It was then transferred to the western end of the former Accueils NotreDame building in 1998 so that it could be more accessible to pilgrims and refurbished in the winter of 1999-2000. The Reconciliation Chapel allows pilgrims to celebrate the sacrament of Reconciliation in one of the usual languages of the Sanctuary (French, Italian, Spanish, English, German, Nederlands and Polish). Refurbished in 2000, the Chapel has 48 confessionals and a preparation area allowing for a greater prayerful preparation. The Confessionals are divided over two floors – 1st floor for the Italian-speaking and Polish- speaking pilgrims and the ground floor for pilgrims speaking one of the other languages (French, Spanish, English, German and Nederlands). The statue of St. Jean Vianney, the Cure of Ars is now placed at the gable of the chapel. Along the Gave, the area opened up by the demolition of part of the old building has allowed for a green area to help with the movement of pilgrims and facilitate confessions in the open air. Between the edge of the Gave and the Church of St. Bernadette a large stage allows for the different open-air celebrations on the Meadow (Prairie) such as that of the 15th August each year. During the winter of 1999-2000 this area was refurbished to make it more accessible. A 2,000m2 area around the stage was resurfaced allowing for the placing of 1,000 sick pilgrims. An awning has been erected to cover the entire stage during the winter 1999-2000. This was to allow for pilgrims, especially the sick and disabled, to assist at Mass in the best possible conditions. Thanks to this renovation thousands of pilgrims can assist at Mass in front of the Grotto during the season. The whole of the Meadow is covered by the sound system thanks to a new sound control room in the Church of St. Bernadette and the lighting has been improved. It is 130 meters long, 85 meters wide, and can accommodate over 20,000 people. ‘The holy place’ is surrounded on the north and south by two ramps of 130m in length, two great arms, as it were, open to welcome the pilgrims. On the west is the front of the Rosary Basilica that serves as a backdrop for all the important celebrations. On the east is the Crowned Statue erected in 1877. The Breton Calvary constructed in 1900 marks the extremity of the area. The Way of the Cross on the hillside weaves along a steep wooded area. It is to the image of the scale of the Sanctuary of Lourdes: 115 figures are represented in cast iron brightly painted in 15 stations along the 1,500 metre path. It was constructed by Raffl of Paris between 1898 and 1911. The other Way of the Cross on the level is found along the Gave in the Meadow. The Oratory of St. Bernadette at the Railway Station of Lourdes. To that must be added Our Lady of Nazareth Chapel in the Chaplains’ Residence, decorated by Sister Mercedes OSB. The Chaplains’ Residence was build between 1876 and 1878 by Durand and Saint-Gilly, architects of the Sanctuary.